We’re pleased to announce a new partnership with Australia’s largest telco who want to use FRED as the basis for their second generation IoT platform. Telcos worldwide have been struggling with a similar problem in the IoT space. How to meet customer needs, and add value, when their customers are already using a variety of IoT platforms and services. Although many Telcos originally rushed to deploy their own IoT platform, low take-up from customers has forced them to accept that the future IoT world is one of multiple platforms and services. So, innovative Telco’s have started to explore how to offer a Multi-IoT Service Platform (MISP) whereby customers can use the Telco connectivity and device management capability but combine with 3rd party IoT platforms and services. 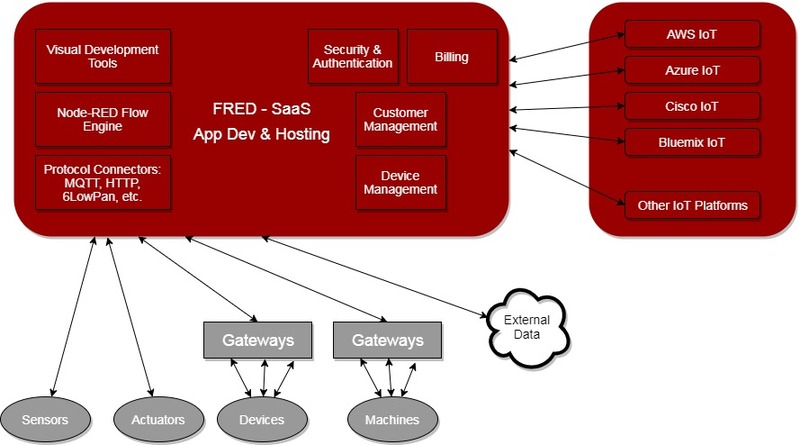 FRED offers a perfect solution to this problem, it can act as a front end broker for incoming IoT messages, doing initial data massage and alerting, but then dispatches messages to the appropriate 3rd party platform where the customer device data is managed and stored. We’ve had a lot of interest in our InfluxDB node and a number of you have been asking if we plan to host an InfluxDB server for our customers. After some consideration, and based on the success of our MQTT service, we’ve decided to go ahead and create a cloud based InfluxDB service that will work tightly with FRED (and MQTT) and take the hassle out of managing a time series DB. We launched our MQTT service last month and have had lots of interest. This is an industrial strength MQTT implementation integrated into FRED. We’ve created a slick management interface to allow you to create connections, manage topics, track messages etc. We also have a public topics service so you can access interesting public data – and share your data if you want. We’ve been using our platform (FRED) and working on Smart Cities for several years – we’ve found that FRED and Node-RED are great tools for developing Smart City applications, especially for folks looking for some basic dashboarding and alerting for smart cities. For those of you in the space, you’ll know we’ve also developed a new node for the popular open data platform CKAN which is available on FRED and in the NPM repository. Swagger: allowing you to create Swagger API documentation for your http nodes. Watson analytics & AI: The tutorial walks you through installing the Watson nodes in FRED, creating an IBM Watson account, setting up the Tone service, and using it from your flow in FRED. IIoT and OPC: We’ve refreshed our IIoT tutorial about the use of FRED and OPC-UA which is a secure architecture focused on industrial automation. OPC-UA extends the highly successful OPC communication protocol, enabling data acquisition and information modelling and communication between the plant floor and the enterprise reliably and securely.